They provide the sons who bring glory to the yellow and black. 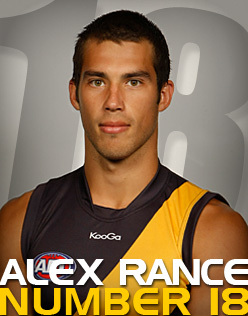 They nurture young talent until it can blossom on the mighty MCG. They feed our boys, clothe them and nurture them through thick and thin. They are our loyal behind the scenes workers and supporters. They know their footy inside out. They are the women of Richmond. And for far too long they have gone unrecognised. Join your friends and colleagues at this prestigious function where we will share both hilarious and heart warming stories about where our players have been and what they have been doing with their lives since retiring. 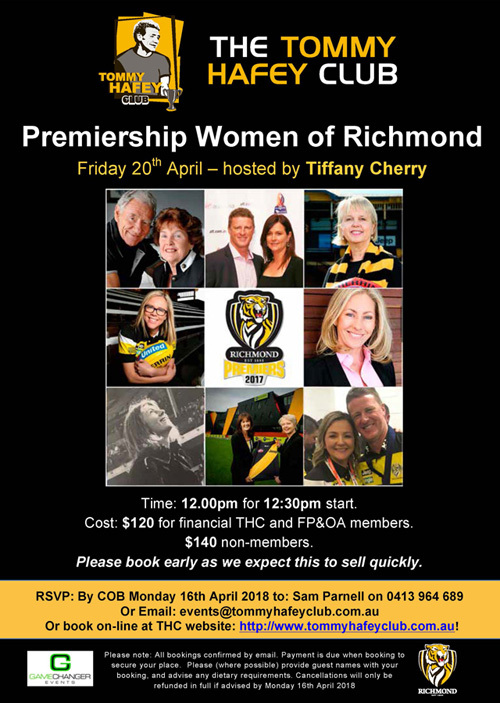 Our MC will be a huge Richmond fan favorite NATHAN BROWN. Click here... to book online. Click here... to download the invitation. 1967 Premiership 50th year anniversary dinner. What a fabulous night! 200 guests packed the magnificent dining room at The Australia Club to honor the 1967 premiership team, represented by all but one living player (Royce Hart could not attend), and including members of the Swift, Barrot, Richmond, Strang and Richardson families. Patron Maureen Hafey was joined by daughter Joanne, Peter and Kaye Hafey. The players gathered privately before the dinner to re-live old times and swap yarns. By the time they entered the dining room, to a standing ovation and rousing rendition of “We’re From Tigerland” Johnny Ronaldson’s goal had travelled 80 metres! 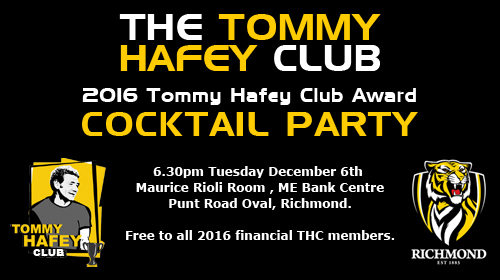 Tommy Hafey Club President Rob Edgley welcomed guests and introduced Australia Club host member Philip Allison, then RFC CEO Brendon Gale who paid tribute to the wonderful achievement of 1967 when a team of average age 23 years, with no finals experience, defeated a highly fancied, more experienced Geelong team. 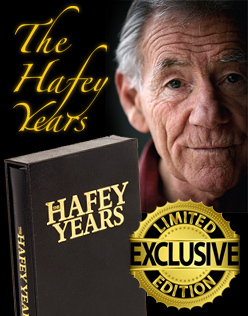 Former RFC President Ian Wilson, who remains the oldest surviving member of the 1967 Richmond Committee, spoke glowingly of the contribution of senior coach Tommy Hafey, then President Ray Dunne, General Manager Graeme Richmond and assistant coach John Nix (who was present on the night). Michael Perry, centre half back in the ‘67 premiership team then talked about the game and showed some tv highlights (in black and white!). It looked a long time ago as over-head shots showed an MCG still with the old Southern stand, the old Olympic stand and the old member’s pavilion. What a crowd though, official attendance 109,000. Following main course, Bobby Phillips conducted a spirited auction of the original 1967 Grand Final footy record, a fantastic black and yellow set of number plates FLAG 67, and a marvellous framed collage of Neville Crowe highlights. 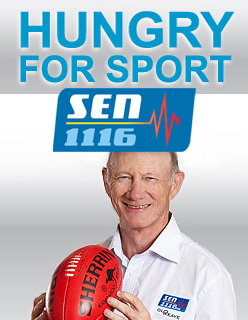 Kevin Bartlett then took to the stage and proceeded to run through every player, showing highlights of their play (except Michael Green who as 20th man did not get a run on the day). What would a show be without a small hiccup and sure enough we had one when it was discovered that the highlights of Billy Barrot, arguably best on ground, and Roger Dean had been inadvertently erased! Only KB could retrieve such a situation which he did with great aplomb. Final tributes were then paid to Maureen Hafey for her wonderful support of Tommy and all the players, plus Barry Stanton who as fitness coach and runner was a key force in the 1967 triumph. The night wound up with some lively music and we’re pretty sure every-one went home happy. I think we’ll have to do it all again in 69! Special thanks to Tracey Browning from Gamechanger Events for helping organise this sensational function. 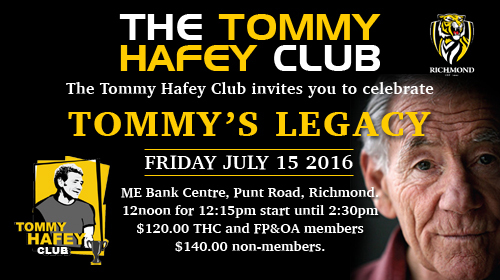 Tommy Hafey Club “Tommy’s” Legacy lunch Friday 15th July 2016. “We often get asked, ‘how do you keep coming up with such great themes’? 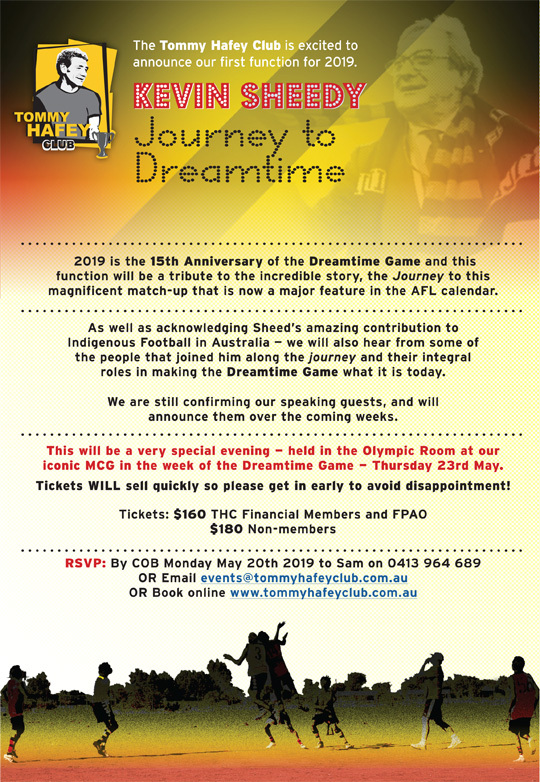 But in the Maurice Rioli room on 15th July, we can confidently say “we did it YET again”! Any theme involving our inaugural patron Tommy is bound to be popular but this one, where we celebrated Tommy’s enduring legacy, was one out of the box. In 2005, we honoured Tommy’s life in football with a record attendance at the Grand Hyatt. It was a big, spectacular show with football celebrities extoling Tommy’s virtues. 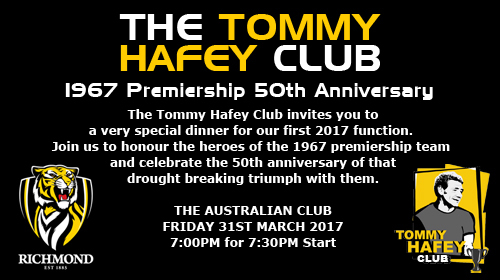 This function embraced players Tommy coached at the four VFL/AFL Clubs, players who Tommy influenced in both football and life. Rex Hunt is passionate about the positive influence Tommy had on his life so he made an ideal master of ceremonies. Peter Hafey, brother and runner for Tommy at three Clubs, was instrumental in attracting some of the biggest names in football to the function including Brownlow medallists Greg Williams and Peter Moore, the Macedonian marvel Peter Daicos, premiership coach Choco Williams, the irrepressible Warwick Capper, our very own Robbie McGhie and many others from the Tigers, Swans, Magpies and Cats. All players spoke of Tommy’s inspirational leadership, friendship and loyalty and especially of the close “family” environment he and Maureen created at every Club. Little wonder he achieved such an amazing coaching record. The Magpie players, including Ian Cooper, to a man expressed their regret that in five grand finals they could not deliver one premiership for Tommy. It still irks them to this day. 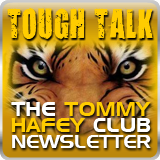 The Geelong boys, Mark Yeates, Andrew Bews, Greg Williams and Darren Flanigan all spoke glowingly of the positive impact Tommy had on themselves as players and people, and the Club. The Swans, Warwick and Greg Williams, were equally effusive about Tommy’s impact in Sydney, an example of which was that in three successive rounds in 1987, the Swans kicked more than 30 goals a match and attracted crowds of 40,000+ to the SCG. A cameo appearance by Dr. Geoffry Edelsten reinforced the sheer power of Tommy’s presence in the Sydney market and what a pivotal role he played in the beginning of what is now a flourishing national competition. Mark “Choco” Williams prepared a special presentation to mark his appreciation of what Tommy had done for him and how his contribution extended beyond the four league Clubs to junior Clubs, schools and country football. The Hafey family was well represented by three generations with our patron Maureen leading the way. KB, Francis Bourke, Bryan Wood, Eric Leech, Ron Branton and special Tiger guests Gerald Betts and Stephen Roach were all present to lend their appreciation of Tommy’s legacy. The function climaxed with visual presentations of Mike Brady singing his song “Tommy” and poet Chris Driscoll’s deeply moving rendition of his poem, “Hafey’s Comet”. The function ended with Tommy’s enduring legacy: “if it is to be, it is up to me”. Yet again it proved the point, don’t miss a THC function or you’ll miss something special. Click here... to view the invitation.